We know these myths well, of course — Anne as “whore,” “scandal of Christendom,” and greedy woman of ambition who would stop at nothing to become queen, always with the implication that she did not deserve her short-lived glory. Dunn’s image infuses Anne’s vision of England with violence and aggression, perhaps not without justification. What attracts far less attention, however, is another story of Anne’s impact. I mean her impact on the imagination of women and men, all the way to the present. All of her images — from Hans Holbein’s portrait to Natalie Dormer’s performance in The Tudors — represent attempts to access the true face of Anne Boleyn and, in doing so, capture her elusiveness so that we may learn from her. A personal anecdote will illustrate the point. As a teenager raised on a steady diet of art and history, I knew Anne Boleyn’s name before I knew her story. In 1986, my mother took me to see Donizetti’s “Anna Bolena” at the Houston Grand Opera. The incomparable Dame Joan Sutherland performed the part of the doomed queen as a majestic woman ruined by love. As the audience listened to Anne lamenting in her Tower prison cell, the composer invited sympathy for her; the set designers created a sense of impending tragedy, with crumbling walls and looming shadows in the background. I did not learn until much later that this operatic heroine was also known as a “seductress,” “plotter,” “tease,” and “poisoner.” At the time, she just seemed a pitiable victim. Two years later I attended an exhibit titled “Drawings by Holbein from the Court of Henry VIII,” which showed at the Museum of Fine Arts in Houston for less than three months. One set of drawings in particular stopped all the attendees in their tracks, beckoning for a closer look: Holbein’s portraits of Henry’s six wives, arranged in chronological order. Standing before the six portraits, I overheard a conversation between two women to my left. One pointed at the third portrait, and murmured, “That’s Jane Seymour. They say she’s the only one he really loved.” Her companion changed the subject immediately: “And which one is Anne Boleyn?” The first woman pointed to the immediate left. “That one,” she answered, and the two friends walked on. Gazing at the portraits of Jane and Anne, I wondered where they fit in to Holbein’s world — one queen known for being loved, and the other one . . . well, simply known. The binary is a familiar one applied women of historical importance — madonna and whore, victim and predator, hagiography and notoriety. Why is it so difficult to do justice to Anne’s power without villainizing her? Historical research provides the facts to some extent, but the records are maddeningly incomplete, matters of interpretation, and often unavailable to those without academic credentials. What’s more, primary sources frequently raise more questions than they answer. Art and literature fill in the gaps until we learn more, and even then, historical accuracy sometimes fails to dispel myth’s hold over the human imagination. Historian Alison Weir attributes the modern obsession with Anne Boleyn to the “romance” in her story: “Anne has become idealised as a historical celebrity, often portrayed as young and beautiful. People define her, more than ever, by her sexuality, as is made explicit in The Tudors. For many, she is the ultimate victim.” It can be easy to ignore her human imperfections and romanticize what she had: self-assurance, a brilliant mind, political influence, staggering wealth, and the devotion of a king. It is also tempting to ignore her mistakes, the consequences of her choices, by blaming her fate entirely on her enemies. The truth, in all likelihood, lies somewhere in the middle — and this is the place where the enduring fascination with Anne lives and breathes. While certain portrayals of Anne in books, films, or on telelvision betray more fantasy than truth, they all testify to a very important aspect of Anne’s influence: her ability to keep everyone guessing. Anne captivates us by the same means that she held Henry VIII in thrall for the long years of their courtship: her distance, alluring and yet always just out of reach. As the Tudor poet Thomas Wyatt writes, “they flee from me.” Wyatt writes of the fleeting affections of his lovers, perhaps even those of Anne herself. But we can also apply the spirit of the line more broadly to the truths about Anne’s life, so many of which flee from the light of discovery. Even so, Anne’s story inspires on many levels, and herein lies the measure of her influence. As the popularity of Tudor history websites like The Anne Boleyn Files and The Tudor Tutor shows, Anne’s unconventional story has made general audiences into students of history, seeking to cultivate their own understanding of the truth beyond popular culture and historical fiction. Moreover, Anne’s story shows that then, as now, successfully challenging the status quo requires backbone, courage, and cunning (which she possessed in abundance), as well as discretion and emotional control (at which she often faltered). Somehow, Anne’s eventual fall from grace does nothing to diminish the awe and admiration she invites — we thrill, even now, to her ambition, determination, and swift rise to power. “She had been a remarkable woman,” writes Professor Eric Ives. “She would remain a remarkable woman even in a century which produced many of great note. There were few others who rose from such beginnings to a crown, and none contributed to a revolution as far-reaching as the English Reformation. To use a description no longer in fashion, Anne Boleyn was one of the ‘makers of history’.” To exercise such influence as a woman, in a deeply patriarchal age, makes her story inspiring even today, perhaps most especially to young women. Yet as Professor Ives also observes, “historians see through a glass darkly; they know in part and they pronounce in part.” The bad news here is that the true face of Anne Boleyn remains largely imagined, frustrating our desire for clarity. The good news is that, for those of us captivated by her story, there is so much more to explore. As Wyatt wondered over four hundred years ago, “I would fain know what she hath deserved.” So would we all. Dunn, Suzannah. The Queen of Subtleties. New York: William Morrow, 2004. Ives, Eric. The Life and Death of Anne Boleyn. Malden, MA: Blackwell, 2004. Ridgway, Claire. “Anne Boleyn — The Mysterious and Maligned One.” https://www.theanneboleynfiles.com. Retrieved February 2, 2011. Weir, Alison. “Anne Boleyn: The Enchantments of Romance.” https://www.theanneboleynfiles.com. Retrieved February 2, 2011. Wyatt, Thomas. “They Flee from Me.” The Norton Anthology of English Literature, Vol. 1. 6th ed. New York and London: Norton, 1993. This article is the best to date, that I’ve read, in illustrating the frustration one feels when combing through all the fiction to glean the facts of Anne Boleyn’s life. Were she a man, we know she’d have been right up there with the Suleimans and the Chomskys and the Einsteins. She is only now being given a small portion of the laurels due her. Who in our lifetime would compare? Really think about that, regardless of the previously listed examples. Who could be that formidable triple- or quadruple-threat that she was?Forget the sexuality. Forget the notoriety. Based solely on her strengths of wit, intellect, intelligence, strategic force, willpower, initiative and vision, this lady rocked the Renaissance world and her spirit is everlasting. While I’m thankful that she’s at least being given some of the credit due her, albiet through the lens of fiction, we need to enhance the change of that lens with which she’s currently being viewed. well i have always believed henry had the power and only henry and if anne or cromwell or anyone else suggested notions to him ,he went along with it only if it suited him ,and if it did not you were in trouble ,anne did not have any power in her own right ,how could she,henry ruled and that was that.anne put herself in a very dangerous position as the “courtly love ” gatherings as far as i know or have read none of henrys other queens except katherine howard continued with this ,ritual? tradition? now i dont know this for sure and im also sure someone is going to enlighten me very fast if im wrong but she does not come across as very wifey and queenly as the others and sorry in advance but thats my opinion. another thing that puzzles me ,regarding anne downfall ,as in the days before she was taken to the tower,was there not one single person who could have maybe heard rumors of what was going on and warned her ,its just sickening to think of her or anyone in the tower ,just waiting for death had she no supporters that could have helped and i know its very easy to say from this era to imagine someone rescueing her and overthrowing henry or was everyone so afraid for their own welfare ,one justs wants to go back there and tell her to run like hell away. I disagree about Anne seeming less queenly than the rest of his wives. I think that should be applied to Catherine H. But, don’t get me wrong, I mean no offence to CH. She was just too young & unprepared for the responsibilities & duties that are expected of a queen. I too, have often daydreamed about how great it would’ve been if someone, ANYONE had done something to save Anne. But, then again, would she even be remembered in the way we remember her? Probably not. May I ask why you believe that Catherine Howard was less queenly than Henry Viii s other queens? What sources do you base your beliefs on? I agree that Catherine Howard was younger, with her ages at marriage claimed to be anything from sixteen to nineteen, as there is confusion about her date of birth, so she was the youngest of his wives. Catherine certainly enjoyed dancing and entertainment, but so what, she was queen and Henry indulged her, but she was also gracious and charming. Although unprepared for queen, she was educated enough to be able to play the role, in public at least. She could dance and was musical, she is described in the sources as behaving with dignity, far from the giddy girl of the Tudors, she loved jewellery and dresses, well as a young woman and queen, again encouraged by Henry, yes, maybe she over spent on clothes, she had to be fashionable, maybe she could have been more careful about her choice of household, but she felt sorry for her former friend. Some modern authorities, Wilkinson and others, believe that Francis Dereham held too much influence and bribed his way into her service, in this she was vulnerable, she was human and there is some evidence that she may have been abused. Catherine intervened to have Henry pardon Thomas Wyatt and pleaded for other prisoners. She showed intelligence in her letters to Cranmer, she provided money and clothing for the elderly and vulnerable Margaret Pole in the Tower, her grace and kindness was noted in York and Lincoln and Henry was sincerely taken with her. There are a few less queenly items, like her complaints about Mary not treating her with the dignity of a queen, but remember that Mary was by now fed up with stepmothers, not that much older, did not agree with the annulment from Anne of Cleves and seems to have seen Catherine as fliverous. Henry allowed the removal of one of her maids as a punishment, the lesson was learnt and the relationship mended. Henry neglected Catherine for a time when he was ill and she put up with rumours that he was going to return to Anne of Cleves for weeks. It is no surprise that she was anxious and demanded to know what was going on. She was not allowed to see him. On the progress much was made of her dignity and charm. As for the information about her adultery, if true, then her queenliness goes out of the window, but there is very little evidence that she actually committed adultery. Much of what we know comes from Catherine’s confession, which does not admit anything else but conversations. Dereham denied everything as he was succeeded by Thomas Culpeper. Culpeper blamed the queen, but denied sexual contact, saying, however that he would have gone further. The implications were that adultery was intended, so was presumptive treason, which means that the couple had imagined the King’s death. Catherine Howard may have been foolish to meet these men in secret, her behaviour unqueenly, but there was no evidence of adultery. Her behaviour that followed may have been more of a hysterical, frightened young woman, who did not know what was about to happen, but this was not surprising. Yes Anne Boleyn acted better, but even Anne broke down and had to be helped. Anne recovered but then her mood varied up to the time of her trial. This again was natural, given that she was being charged with a capital offense, even though she was innocent. In the end, Catherine Howard was as dignified as any queen, she was composed and made a good death. 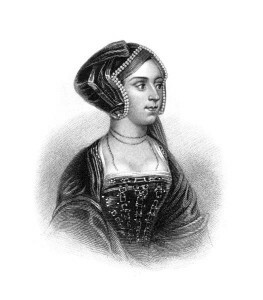 Had Henry not lost his cool or her Protestant enemies not revealed her alleged past Catherine Howard would have gone down in history for her generosity, her charm and clemency, not as being a ninny and a cheat, the two myths of novels and drama. I would say the John Hoskins portrait is closest to what I percieve as being Anne B. There is just something about it that draws my eye to it.